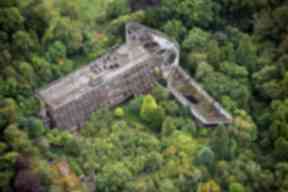 St Peter's Seminary has lain derelict in woodland for almost four decades. The owners of a historic building which has lain derelict for almost 40 years are willing to give it away - but can't find anyone to take it. 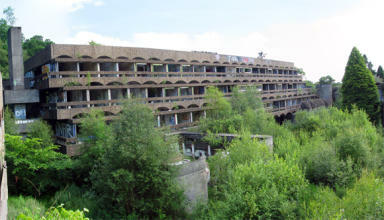 A-listed St Peter's Seminary in Cardross, Argyll, was built as a training college for priests in 1966. 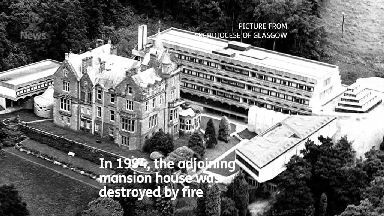 It closed in 1980 after trainee numbers fell, before a short spell operating as a drugs rehabilitation centre. Once voted Scotland's best modern building, it now lies abandoned in woodlands, covered in graffiti. The Archdiocese of Glasgow has accepted it will have to give the site away - if it can find someone to take it. Ronnie Convery, director of communications, said: "It remains something we have a responsibility for, but that we can't do anything with. "We even got to the stage where we said we'd give it away for nothing, including the beautiful estate around it. "But even at that stage no-one is around to take it on. The problem is that it's very difficult to do anything with it. "It no longer functions as a seminary and because it's listed and on greenbelt, to find another use is proving practically impossible." To architectural expert Alan Dunlop, the building is of "true international significance" but that view is not shared by everyone. He said: "Lots of people describe it as a car park, lots of people online saying 'why don't we just demolish it?'. "But although it's dilapidated at the moment, St Peter's Seminary is a building of importance in Scotland and also a building of true international significance. "It was built at time when Scottish architects were among the best in the world. "It's important because of its magical setting, set within this Kilmahew landscape, and also because of its structural ingenuity and quality of natural light. "It's a big building but looks as though it almost floats off the ground." Plans to transform it into an arts venue fell through. The old seminary came close to earning a new lease of life in 2016 when a Glasgow arts company planned to transform it into a £10m performance and exhibition centre. However, despite spending more than a decade on the project, NVA's plans collapsed when funding was lost. Argyll and Bute Council has designated the land an "area for action", raising hopes a new purpose will soon emerge. Mr Convery said: "It's a good thing to list buildings because they are of significant heritage and importance. "But that can't be an albatross placed round the neck of the owner if the owner can't find any alternative. "It's unfair if the building has completed its service but it then can't be sold, that the previous owner should continue for decade after decade after decade for responsibility of its maintenance. 'We would hope that after a certain period the authorities would recognise that as good stewards we had done everything possible to find alternative uses for it but where there is no alternative use something has to give." There are currently 2341 listed buildings on the 'at risk' register in Scotland. Many owners struggle to find a fresh use for them after their original purpose is exhausted. The Scottish Historic Buildings Trust say a number of factors play a part. "It's all about money, if you have money you can do what you want, " they say. "A lot are either owned by people who don't have the money to repair them. "Local authorities don't use their powers to force owners to repair them. Or sometimes it's the wrong building in the wrong place. "It can be a beautiful building but in such an isolated place that's its so difficult to find a use for it, and the use its built for is usually in decline. "If we could catch them just on the cusp of becoming expensive to repair that would be the best time to do it, but obviously we can't always do that."